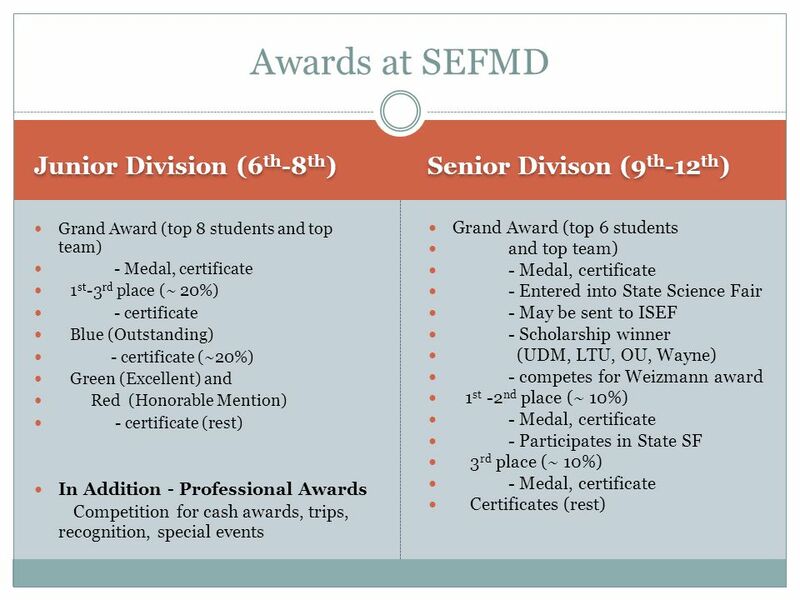 KATHY KITZMANN & TIM FINO CO-DIRECTORS, SEFMD 2015 Science Fair Projects ~ Are they worth it? 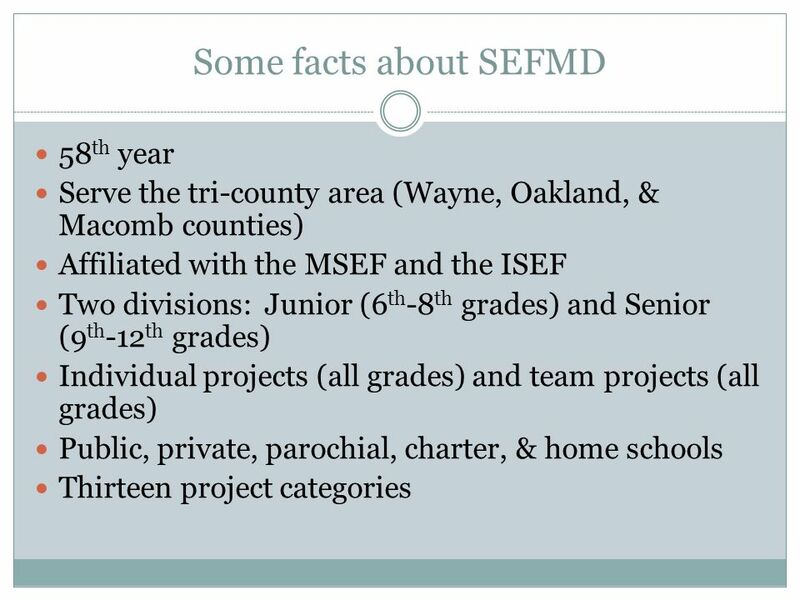 1 KATHY KITZMANN & TIM FINO CO-DIRECTORS, SEFMD 2015 WWW.SEFMD.ORG SF2015@SEFMD.ORG Science Fair Projects ~ Are they worth it? 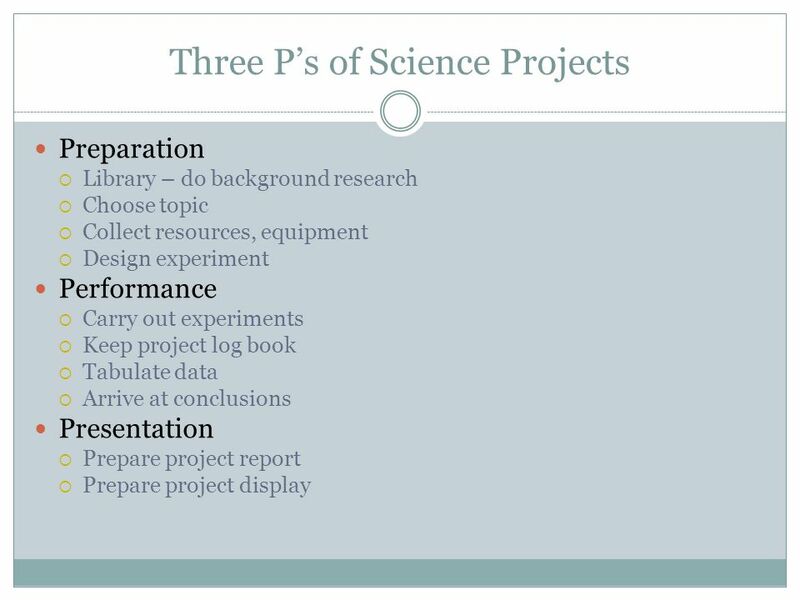 2 What is a Science Fair Project? 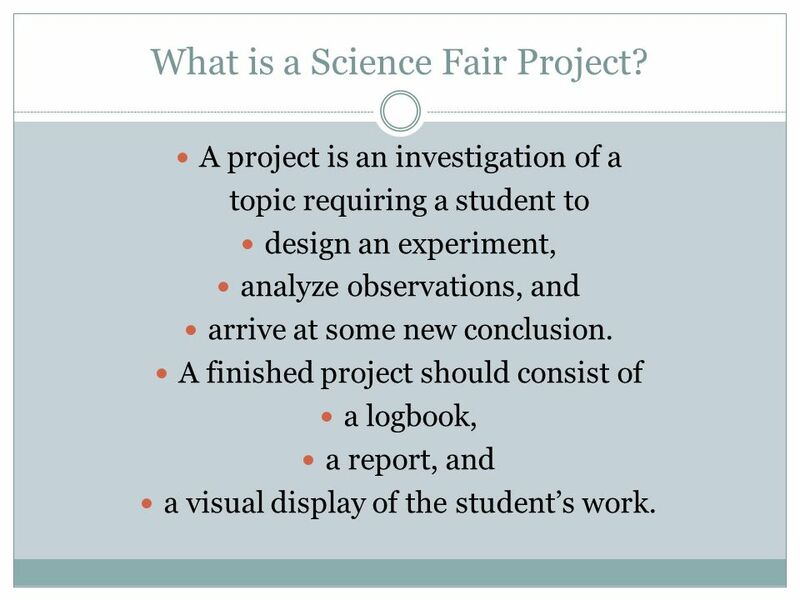 A project is an investigation of a topic requiring a student to design an experiment, analyze observations, and arrive at some new conclusion. A finished project should consist of a logbook, a report, and a visual display of the student’s work. 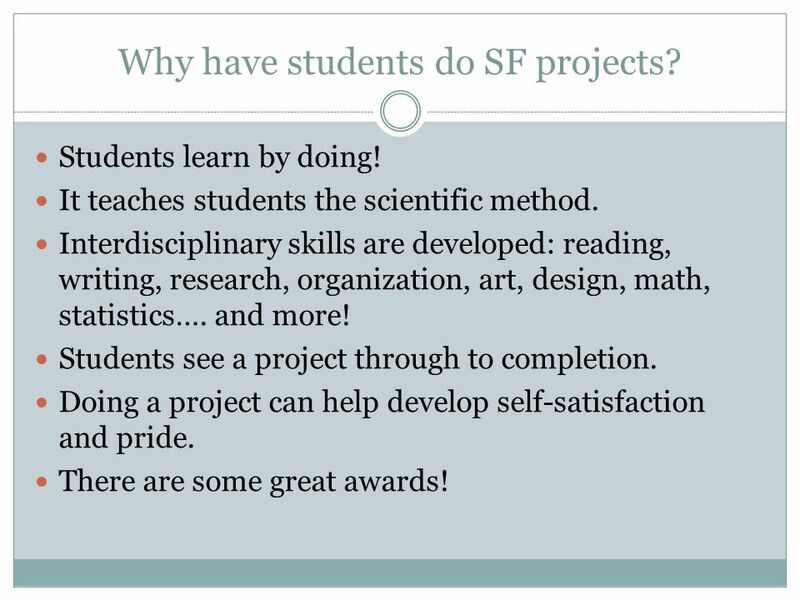 3 Why have students do SF projects? Students learn by doing! It teaches students the scientific method. 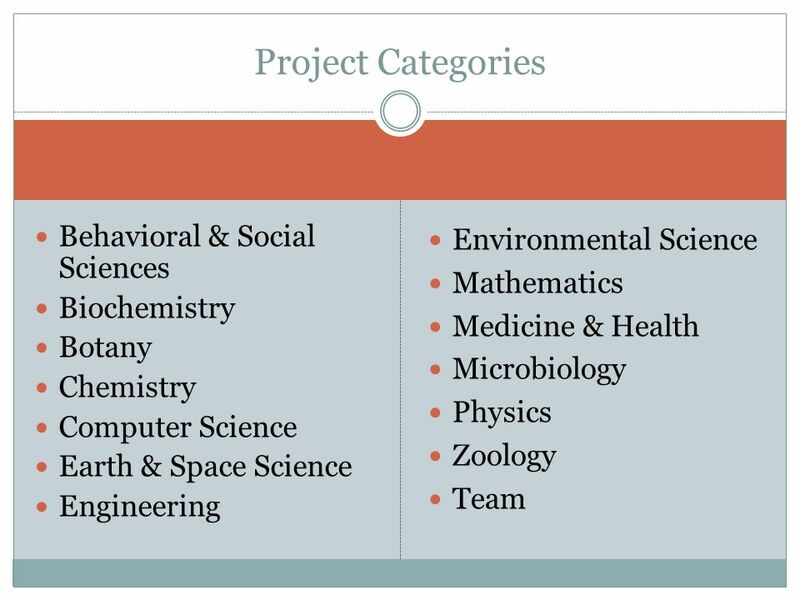 Interdisciplinary skills are developed: reading, writing, research, organization, art, design, math, statistics…. and more! Students see a project through to completion. Doing a project can help develop self-satisfaction and pride. 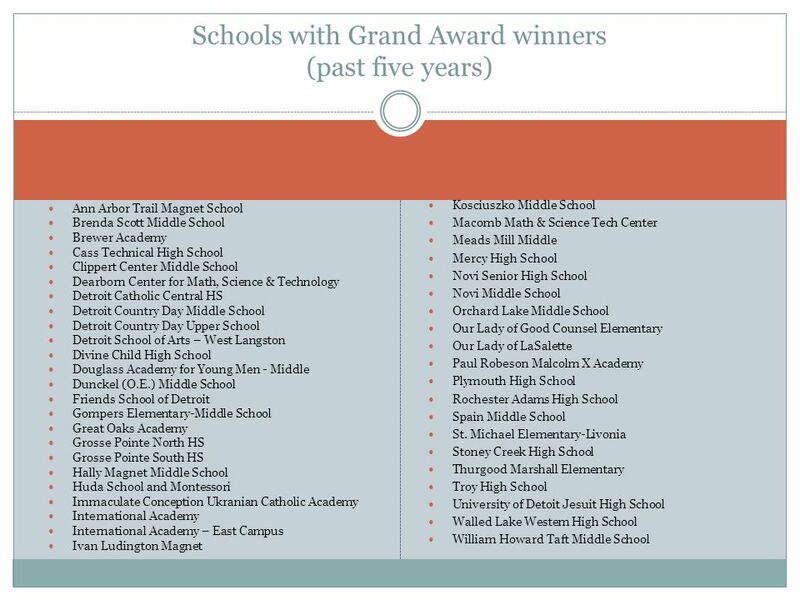 There are some great awards! 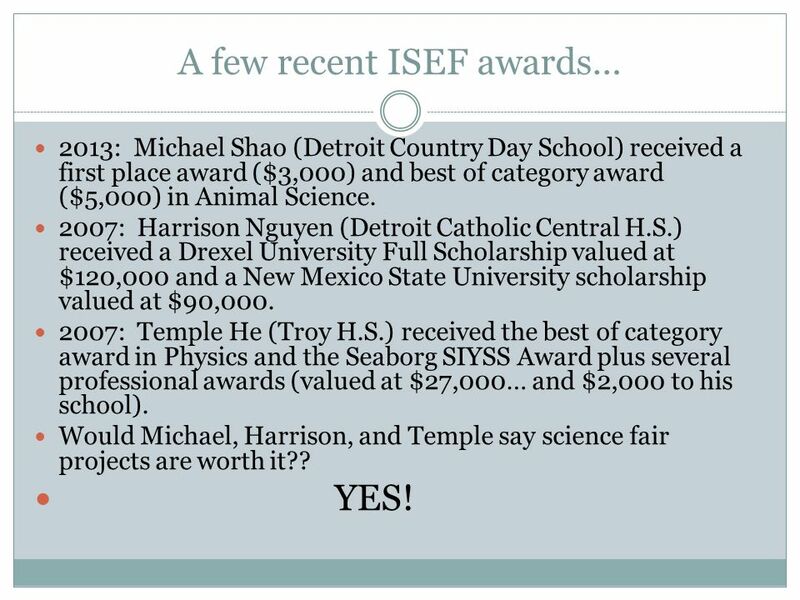 10 A few recent ISEF awards… 2013: Michael Shao (Detroit Country Day School) received a first place award ($3,000) and best of category award ($5,000) in Animal Science. 2007: Harrison Nguyen (Detroit Catholic Central H.S.) received a Drexel University Full Scholarship valued at $120,000 and a New Mexico State University scholarship valued at $90,000. 2007: Temple He (Troy H.S.) received the best of category award in Physics and the Seaborg SIYSS Award plus several professional awards (valued at $27,000… and $2,000 to his school). Would Michael, Harrison, and Temple say science fair projects are worth it?? YES! 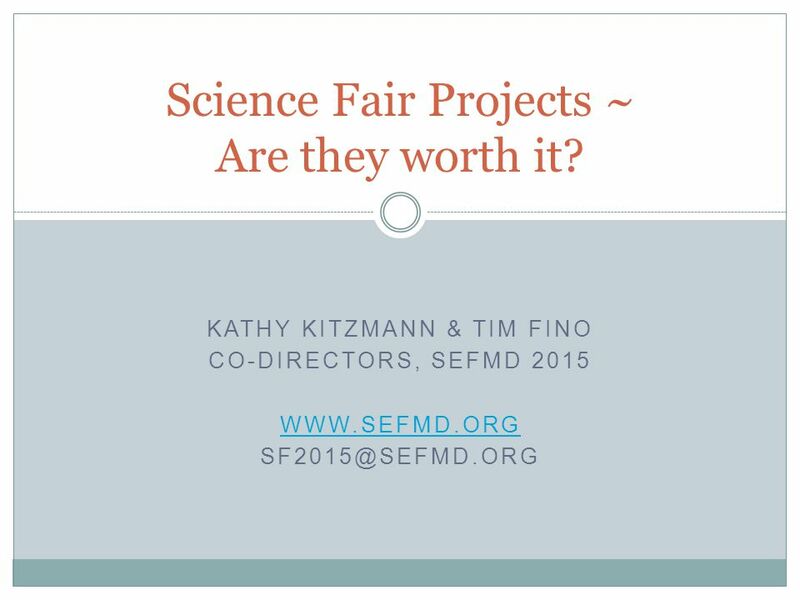 Download ppt "KATHY KITZMANN & TIM FINO CO-DIRECTORS, SEFMD 2015 Science Fair Projects ~ Are they worth it?" Team Manager Training October 17, 2013 Northwest ISD. The Ren Baldwin Student Technology Festival. Purpose To showcase authentic technology integration of student work from the classroom. To honor Ren Baldwin. FMS Science Fair Sponsors Meeting September 9, 2013. Avoid topics that are limited. A student should not write a report on a topic that can be explained in a few words or a sentence. Bad topic: What crops. Call to Action! Step Up Loudoun Youth challenges you to make a difference in your community. BEAL BANK DALLAS REGIONAL SCIENCE & ENGINEERING FAIR 55 th YEAR JUDGING ORIENTATION 1. Organization 2. Scoring 3. Conduct. BEAL BANK DALLAS REGIONAL SCIENCE & ENGINEERING FAIR 53 rd YEAR JUDGING ORIENTATION WELCOME. General Judging Points o Recruit Team Members o Bring Team member list o Community Judges will be added to your team o Paper with what to do when- on. Judging Orientation 58 th Annual DRSEF. Agenda 1) Organization 2) Scoring 3) Conduct. Science Fair Workshop I have not failed. I've just found 10,000 ways that won't work."... Thomas Edison. 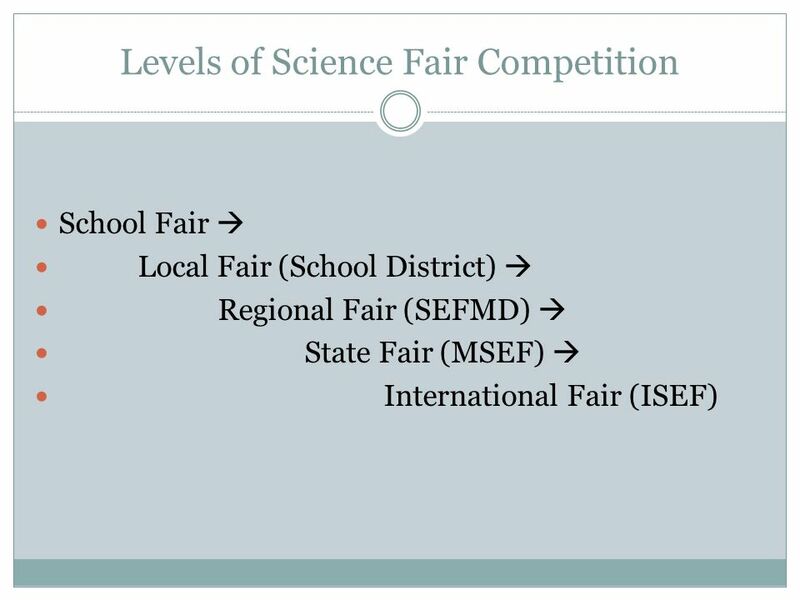 NEWELL SCIENCE FAIR BY: MICHAEL S WHAT IS A SCIENCE FAIR? A science fair is generally a competition where contestants present their science project experiments. SCIENCE FAIR CLUB AT SOUTH. WHAT? Science Fairs let you explore a scientific problem and create your own investigation Science Fairs give you practice.